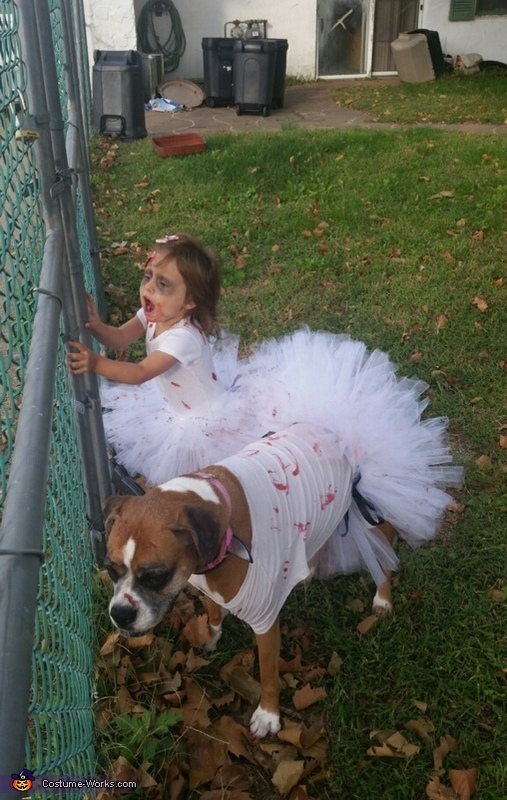 My daughter Maiden & my sisters fur baby Sophie are wearing zombie ballerina costumes. The idea came from watching The Walking Dead. My sister Colleen did the makeup and they are both wearing tutus made by me, along with a plain white top covered in fake blood. We used a gash wound for Maidens forehead that you can buy from any Halloween store or even online. Sophie has an old collar on that we used to put a knife headband over using zip ties to make it look like she has a knife stuck through her neck. Colleen used grey eyeshadow around Maidens eyes and fake blood on both of their faces. Most items can be bought at any store around Halloween. It's a simple and easy costume to make so long as you know how to make a tutu or you have one your willing to tear up and put blood all over it. Best costume ever. Lets vote for maiden.